The Office of the Secretary-General provides support to the Secretary-General in the exercise of his functions and the fulfillment of his mandate, including the preparation of his daily activities, missions abroad and overall coordination of the work of the OECD Secretariat. The Office is lead by the Chief of Staff and OECD Sherpa. The Secretary-General is assisted in his function by OECD Deputy Secretaries-General. Policy oriented and specific recommendations and timely advice on key issues at the centre of national debate. An initiative to connect the Secretary-General, OECD Staff and Delegations to latest, cutting edge thinking. 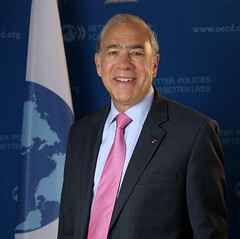 Coordinates OECD contribution in global fora, maximising the leverage of its work, standards and policy recommendations. Deepens OECD's understading of the complexity of policy challenges.